Food can be a powerful marker of our collective memory. For many, summertime is defined by our food—backyard barbecues, homemade peach ice cream, tomatoes from the garden, and snapping peas on the porch. People, place and time are crystallized in our interactions with what we eat. For others, the summer months can be crippled with insecurity and marked with isolation. Kids who depend on school breakfast and lunch no longer have the stability of those meals. Parents who struggle to make ends meet during the school year have to make tougher decisions once school lets out. Only 1 in 12 kids who receive free school lunch have access to free summer meals. The Kentucky Association of Food Banks (KAFB) is a 501(c)3 charitable organization working to end hunger in Kentucky. KAFB’s seven-member food banks serve all 120 Kentucky counties in partnership with a network of over 800 local food pantries and shelters. If you need assistance finding food, please do not hesitate to contact Kentucky Association of Food Banks. KAFB maintains a listing of 800+ charitable feeding organizations across Kentucky. Call (859) 986-7422 or email info@kafb.orgif you need a referral. For children and teens specifically wanting to access summer meals through Kentucky Department of Educations’ Summer Food Service Program, text “FOOD” to 877877 to find a summer meals site in your community. There is not yet a statewide 211-type call service to call for information on local food pantries. It’s a goal! KAFB has been working with the Kentucky Department of Agriculture on an online GIS map that would have information at the local level on how to find food. For more information go to www.kyfoodbanks.org. Volunteer at your local soup kitchen or shelter. Host a food drive or a “virtual food drive” (fund drive). Because of the purchasing power of our food bank network, KAFB members can use a $1.00 donation to secure many times more food than a canned food item that someone bought for $1. Advocate for legislative solutions to hunger. For example, the Farm Bill—legislation that touches nearly every way we provide food to communities in this country—is up for reauthorization by Congress. The Farm Bill represents an opportunity to strengthen and improve key federal nutrition programs, such as the Supplemental Nutrition Assistance Program and the Emergency Food Assistance Program, which are critical to the health and well-being of families struggling with hunger. Has the triple benefit of increasing access to healthy food among our struggling neighbors, providing a new market to Kentucky farmers for their surplus and Number 2 grade produce, and reducing the amount of wasted food in Kentucky. Farmers will tell you that hate to see anything go to waste. It’s not just the value of a tomato they are donating; they are also donating labor to pick it, boxes to pack it in, and fuel costs to transport it to a food bank. The program helps farmers get their unmarketable fresh produce to a Kentuckian facing hunger rather than going to waste in the field. Farmers will also tell you that an acre of tomatoes can be just as profitable as an acre of tobacco—if they can only find a home for it. Knowing that KAFB will take as many of their seconds as our funding allows helps free producers up to focus on marketing their more profitable firsts. Often the last percentage of sales makes the difference in a producer’s bottom line, even the difference between breaking even and making a profit. Works to end child hunger in Kentucky by connecting kids to effective nutrition programs like school breakfast, after school meals and summer meals. -In Kentucky 338,904 kids qualify for free or reduced-price school lunch. -When the school year ends, these children are at risk of going hungry. -Only 1 in 13 low-income children in Kentucky who needs summer meals is receiving them. 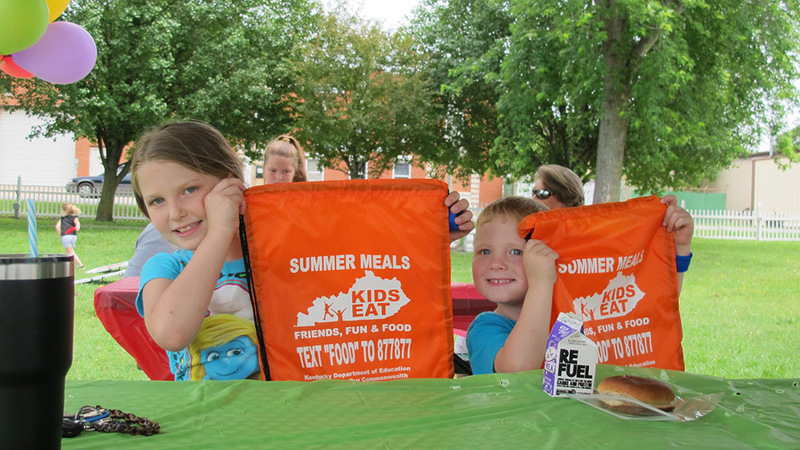 -Ky Kids Eat is working to connect children and youth with summer meals programs to help close the summer hunger gap.